It's raining and cool today. Cicadas started to sing. Many areas in Niigata Prefecture and border area between Niigata and Fukushima prefectures had a record rainfall. Some rivers burst their banks and several roads were closed to traffic due to landslides. Kyoto was also caught in a thunderstorm on 28th. Trains were stopped due to lightning strike there. 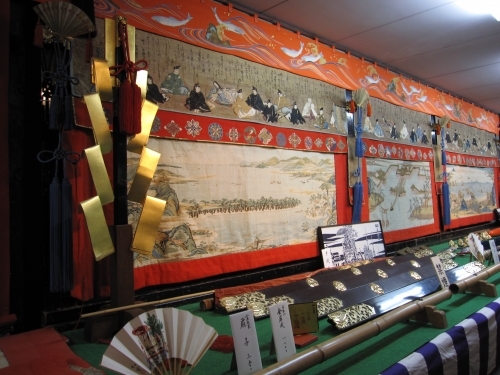 However, events of the Gion Festival including the ritual to purify mikoshi(portable shrine) were held. There were few visitors. Finally, the Gion Festival in Kyoto ended on the 31st. I get back to talking about Yamaboko-junko(山鉾巡行) on the 17th. 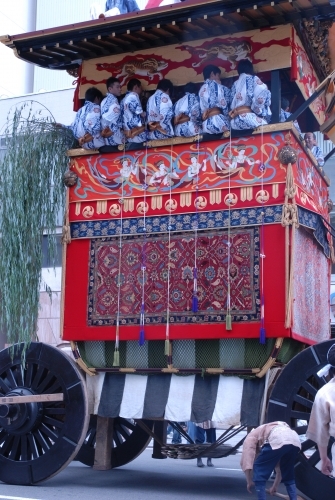 On the 17th, a parade of 32 beautifully decorated floats named Yamaboko-junko(山鉾巡行) was held. yotoreached 35.7 degrees Celsius on the 17th this year, but more than 200 thousand visitors gathered along the route. 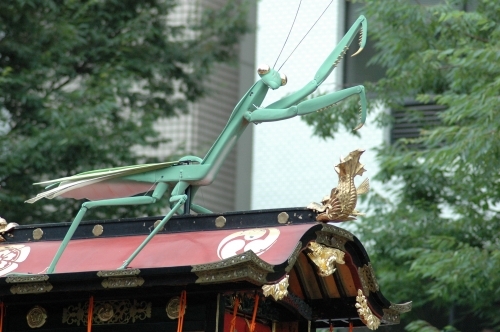 At the head of the parade, the Naginata-boko(長刀鉾) float appears. A child in traditional attire who serves as a messenger of God is on the float. The parade starts when he cuts the sacred rope. Naginata is a halberd-like weapon. The starting order of several yamahoko floats is fixed. Minami-kan'non-yama(南観音山) brings up the rear. Other floats draw lots to decide whose turn it is every year. 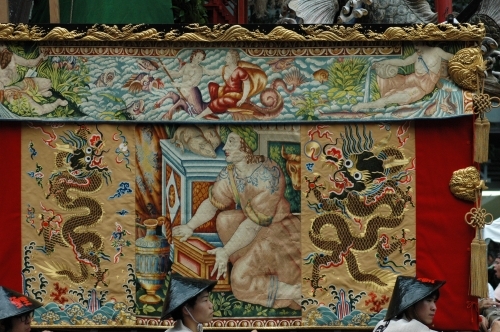 The floats are decorated with antique textiles, paintings and carvings. But many of these floats substitute their remakes to avoid damage to them. You can see the genuine articles at a local meeting place around each float on the night of the 16th. 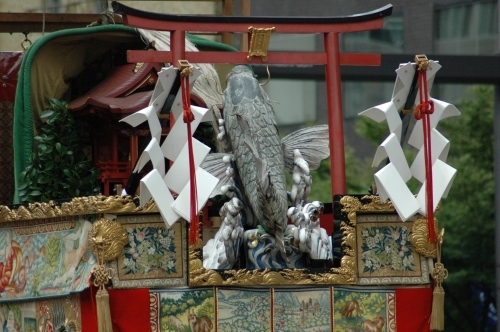 Wooden carp is said to be created by the famous sculpture Hidari Jingoro(左 甚五郎) in the Edo Period. Wooden mantis on the roof is manipulated with dexterity. 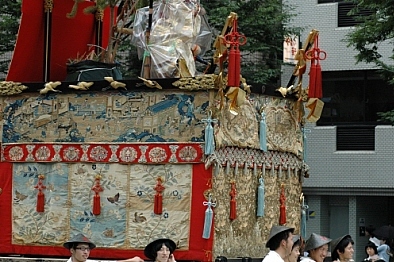 Three yamahoko floats of Ofune-boko(大舩鉾), Taka-yama(鷹山）and Hotei-yama(布袋山) can't return to the parade due to lack of funding and a manpower shortage after having been burned by the rebellion at the Hamaguri Gate (蛤御門の変) in 1864 or a big fire in 1788. However, residents hold the festival by displaying these floats' ornaments within their towns. Ofune-boko aims to return to the parade. Other yamahoko floats were also damaged by fires and wars to some degree. People involved in the festival never eat cucumbers during the festival. Because the shrine crest of Yasaka Shrine is similar to the cut surface of a cucumber. That's the only reason. A confectionery shop named Kashiwaya Mitsusada(柏屋光貞) sells Gyoja-mochi(行者餅) only on July 16th. Advance reservations are required. I've never had it before. In 1806, an ancestor of the current shop master in ascetic training as a mountain ascetic hermit had an omen in his dream. It is said Gyoja-mochi was based on the omen. The confection is made by wrapping a mixture of rice cakes, miso and powdered Japanese pepper in thin crepe-like pancakes. photos were taken some years ago, so many floats had rainproof cover. Compared to Yamaboko-junko, shrine rituals are sober. The following two rituals are also held on the 10th and 28th. In the morning, the water taken from Kamo River is purified. It's called Shinyosui-kiyoharae-shiki(神用水清祓式). In the eveining, people head for the Shijo Bridge from Yasaka Shrine carrying one of three portable shrines(mikoshi) on their shoulders. Some men holding large burning torches lead the parade. People also hang charcoal cinders of the torches wrapped in soft paper near their front doors as a charm against bad luck. Mokoshi is purified by sprinkling the water over mikoshi with sakaki(species of evergreen sacred to Shinto) on the Shijo Bridge. People carry mikoshi back to the shrine and decorate the portable shrines. It's called Mikoshi-arai-shiki(神輿洗式). On the afternoon of the 10th, shrine parishioners including children in historical costumes parade to welcome mikoshi from and to the shrine through their towns. On 15th, the shrine's priests get the divine spirit to move to mikoshi with lights out. On the evening of the 17th, after a ceremony, shrine parishioners parade from the shrine to a rest house for the god through their towns holding three mikoshi on their shoulders. On the evening of the 24th, three mikoshi are carried from the rest house to the shrine through the city. The divine spirit returns to the shrine late at night. 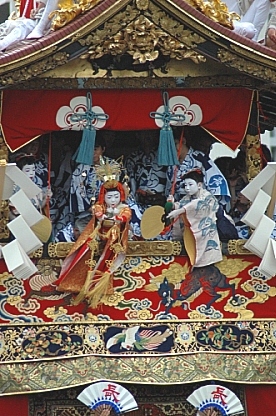 During the festival period, various events to pray for a safe festval are held and many performances are dedicated to the god at the Yasaka Shrine. Hanagasa-junko(花傘巡行) is a parade including musicians, dancers, maiko and geiko to the Yasaka Shrine held on the 24th. They performed at the shrine. Originally, Yamaboko-junko used to be held on the 17th and 24th. Yamahoko floats paraded to run interference for the transfer of mikoshi, so 23 of 32 floats paraded on the 17th and 9 floats did on the 24th. All of yamahoko floats have paraded on the 17th since 1966 due to the tourism policy of Kyoto City. Instead, Hanagasa-junko came to be held on the 24th. Recently, a new move to restore the parade to its original state surfaced. In the evening of the 29th, the organizers of the festival report the successful end of the festival to the god at the shrine. There are few visitors. 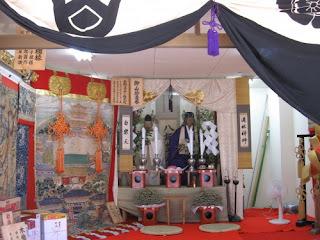 On the 31st, a ritual named Nagoshi-sai(夏越祭) is held at Eki Shrine(疫神社). Eki Shrine is an auxiliary shrine on the site of the Yasaka Shrine and is dedicated to Somin Shorai(蘇民将来), the god of avoidance of disease. Eki(疫) means disaster. Somin Shorai gives shelter to a tourist during the trip. The tourist is Susanoo-no-Mikoto(素戔嗚尊) who is the god enshrined in the Yasaka Shrine. As a token of gratitude, Susanoo gave him a slip of paper with "蘇民将来之子孫也(I am a descendant of Somin Shorai)" written on it. Somin Shorai's family stayed free of disease due to the slip of paper. 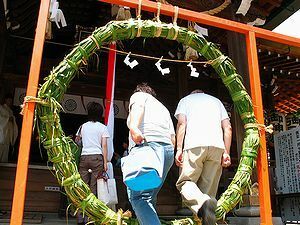 On the day, worshippers go through a large loop made of Japanese blood grass to purify them. It's called Chinowa Kuguri(茅の輪くぐり). Then they receive the slip of paper as a lucky charm from the Eki Shrine. The slip of paper is also attached to chimaki available at the Gion Festival. This is the end of the Gion Festival.